A perspective placing the environment as a top priority in purchasing new furniture, always considers referring to the earth for the best solutions. We help ourselves by helping the planet, that one planet that supports all of mankind’s existence, by using only natural materials. It perpetuates the proactive cycle of sustainability in how we grow the materials from the earth, and ultimately returning the expended material to biodegrade back into the earth. Ideally, ‘we leave only footprints’. The coolest and best materials I have found are natural rubber latex, coconut coir, and jute. Each comes in varied forms for certain applications, and these materials are all from plants which we can grow efficiently and sustainably. Because we avoid the weary mix of chemicals and additives used to make nice plastic, we are relieved of toxic, cheap, and weak materials found in mass production. 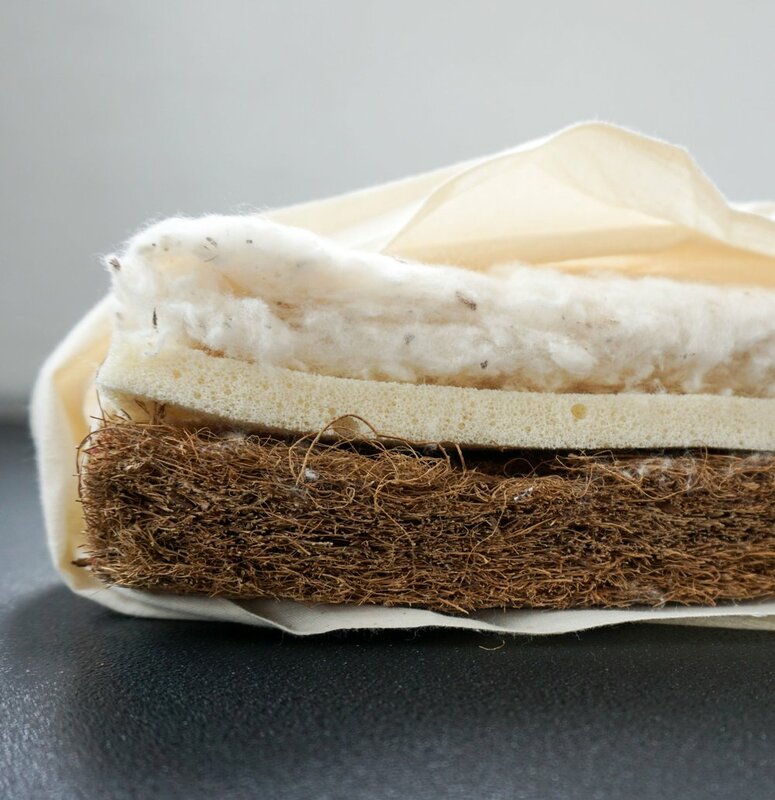 CLICK THROUGH: a natural fiber content makes fabric biodegradable. 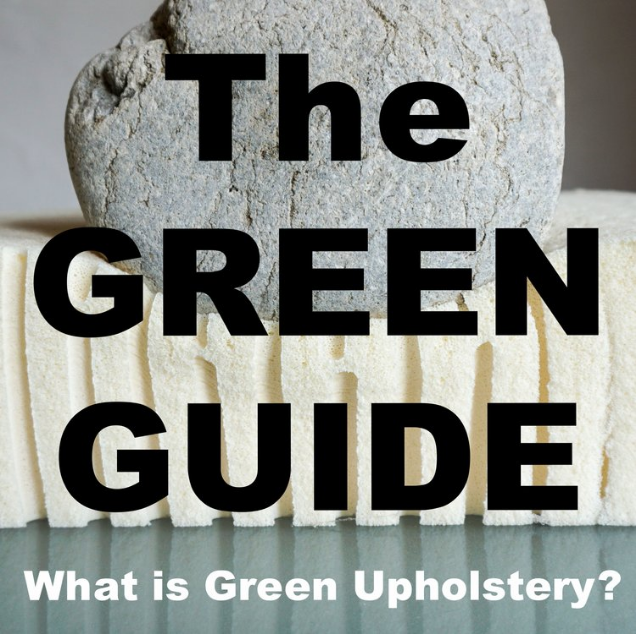 A single source dedicated to the power of Green Upholstery! Better yet, plant based materials are just as durable, and just as rugged, than most petroleum based materials common to mainstream retailers. We know for sure they’re healthier than fuming flame retardants and formaldehyde which are the worst enemies in disguise. When you plop onto your couch’s cushion, little bits of foamy toxic fumes are let loose. Flame retardants don't stick to foam so we consider most polyurethane foam made between 1975-2014, fuming and off gasing offenders up to no good! The PBDEs and chlorinated Tris have been linked to cancer, hormone disruption, reduced IQ, and other health problems. Recent studies at Duke University have found Chlorinated Tris to greatly affect toddlers, causing such health concerns as antisocial behavior, memory loss, diabetes, lower levels of male hormones and hyperthyroidism. The study, reported on in many outlets including the Charlotte Observer, found flame retardant in the blood of every child they tested. 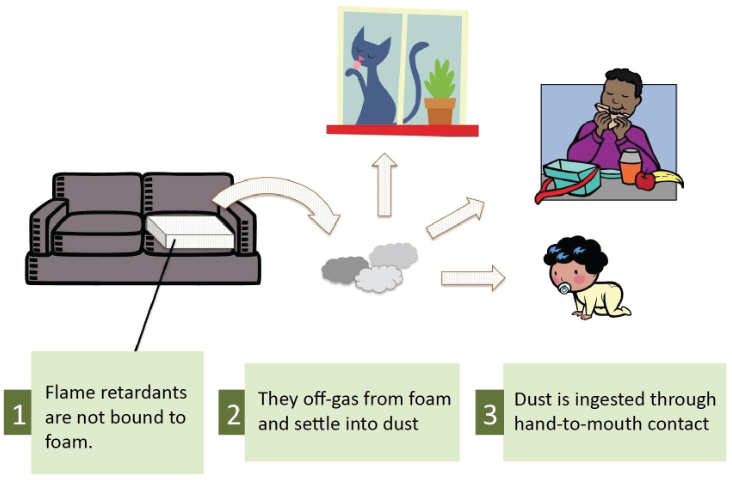 Flame retardants stuck to household dust is easily ingested by toddlers on the floor or inhaled by auntie walking by. The Green Science Policy Institute. Formaldehyde vapors travel, too. Newly purchased pressed wood products give off the most fumes and the vapors decrease over several years. Extra moisture in the air, a room heating up or bumping a pressed wood item like a bookshelf can lead to increased levels of formaldehyde in the air. Check out a detailed write-up Formaldehyde in pressed wood products safety Fact Sheet from the Australian government's Department of Health. 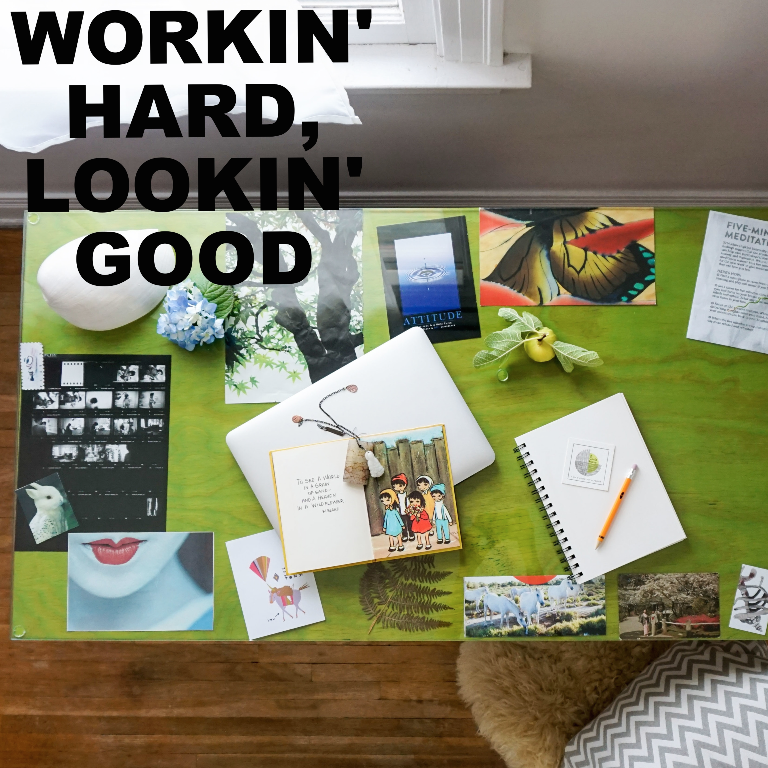 CLICK THROUGH: Why our custom service is all about traditional AND green upholstery! Leading factors of global warming: 85% from burning fossil fuels and 15% from deforestation. Greenhouse emissions, aka carbon dioxide, are the greatest contributer of global warming. There's proof of temperature changes, and loss of animal species (up to 1000 species by 2050). Of the burned fossil emissions: 40% are from powering power plants and generating electricity—are electrical cars as helpful as we think? 35% from transportation like ships, cars, and big rig trucks. Consider the choice to 'buy local' or restore a piece to avoid imported transportation. Smart Choice: Buy products made with American wood (avoid transportation consumption) from managed forests. Regeneration of trees alleviates global warming, as well as the tremendous ongoing loss of drinking water on a global scale. Top emission producers: 29% China, 19% USA, 11% Europe, 6% India, 5% Russia. Wowza! Who knew furniture could raise such important issues? What we buy is a choice we make. Isn't it nice to know that there are healthy alternatives that are not toxic? We have the power of knowledge and our pocket books, along with some good intent, so why not buy something that makes sense? Click the image to learn more about my customer service! Mother Nature Network’s Why is my new piece of furniture emitting a nasty odor?